I started a batch of homebrew yesterday for the first time since April – and the infection. There’s a whole post to be made on that batch, but nobody needs that right now. The scars are still too tender. The early signs do not augur well, but I am yet hopeful. My mixed grain from earlier this year was full of weevils somehow (it was in a sealed container), and I was too lazy to go back to Homebrew Supply in San Marcos to get any more. 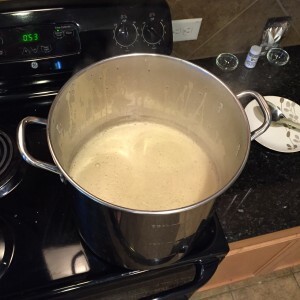 So that left me with the five pounds of Briess Bavarian wheat dry malt extract I bought Saturday and a pound-and-a-half of honey I bought from a coworker who keeps bees. Starting specific gravity was 1.058 @ 60 degrees. We shall see. In other news, three people have added the book to their reading list on Goodreads – and I’ve only been on that platform for a few days. I’ll raise a glass to you guys once this batch is ready. Previous Previous post: A New Look—For a New Book! Next Next post: Yo, Dude, Why’d You Self-Publish?